I first came across celery juice when my friend Remy, the beautiful face behind Veggiekins Blog, and I were picking up some juice freezes at Pressed Juicery. Remy decided to order a shot of celery juice just to try and honestly at the time I thought it was disgusting. You may even remember me mentioning celery juice at the top of the list in my blog post, Keep An Eye Out For These 5 Wellness Trends in 2019. Well… shortly after our trip to the juice shop I started to notice celery juice popping up everywhere, especially on Instagram, so I decided I had to give it a second chance. It’s funny how our taste buds adapt over time because now I find myself drinking celery juice every damn day! Celery makes a powerhouse of a green drink that is known for detoxifying and cleansing the digestive system. According to Anthony Williams, the author of Medical Medium, “just 16 ounces of fresh celery juice every morning on an empty stomach can transform your health and digestion in as little as one week.” To be honest, he’s the guy that made celery juice so popular in modern day, but celery juice has been around for a long time now and was even used as a hangover cure in ancient times. So why should we drink celery rather than eat it? I found this article on Goop that was written by the expert himself, Anthony Williams, that explains why we should be drinking celery juice rather than eating it as a yummy veggie in meals. Below is what he has to say about it! “If you only ate celery, you wouldn’t be able to receive all of its concentrated undiscovered cluster salts. These cluster salts are not just mineral salts; they’re far more specialized. Mineral salts are critical for our bodies to function, but there is an undiscovered subgroup of sodium that I call cluster salts, and these are unique and special in the way they support the liver’s personalized immune system and bind onto toxins and help flush them from the liver. I’ve been drinking celery juice every morning for about a month now and I won’t be stopping anytime soon! Aside from a healthier gut, I’ve noticed a handful of other improvements in my health even some of which I didn’t realize were imbalanced until celery juice started to heal me! Ready to hear about the health benefits of drinking celery juice? I’m sure we’ve all suffered from the discomforts of indigestions, acid reflux, and bloating. It’s no fun! This is where the infamous celery juice steps in, as its natural sodium content helps to raise stomach acid, and when you drink celery juice first thing in the morning it aides in easy digestion for the rest of the day. So how does this work? Stomach acid is essential for breaking down food, particularly proteins. If your stomach acid is low, the body then must step in and use more resources to try to digest your food, thus making you extremely tired from your organs overworking. Once I started drinking celery juice every morning, I noticed that my body digested food a lot easier. Instead of that uncomfortable feeling of bloating and heaviness after meals, I instead felt satiated but light and able to still carry out activities without discomfort! Cleared acne and improved skin health. Clear skin was definitely not a benefit I expected from drinking celery juice, but I’ll take it! I started to notice my skin clearing up after about a week of drinking celery. Celery acts as an anti-inflammatory and is loaded with vitamins A, B, C, and K, which are essential for repairing skin damages. They also produce a natural collagen providing nourishment and aiding against wrinkles. But that’s not all, there are numerous minerals present in celery juice, including calcium, potassium, magnesium, selenium, and so on. Regular intake of these minerals can result into bright and glowing skin. A second benefit that I was not expecting from celery juice is an improvement with my sleep cycles. But it turns out that celery can help treat insomnia because the magnesium as well as essential oil content of the juice imposes a soothing effect on our nerves. As a result, we can relax and enjoy a sound night of sleep! Celery juice helps to decrease and moderate blood pressure. Drinking just one glass of celery juice is known to diminish the secretion of stress hormones and relaxes the muscles. If that’s the case then gimme all the celery juice puh-lease! All these benefits sound pretty great, right? So great that you may be wondering how to make your own celery juice at home! 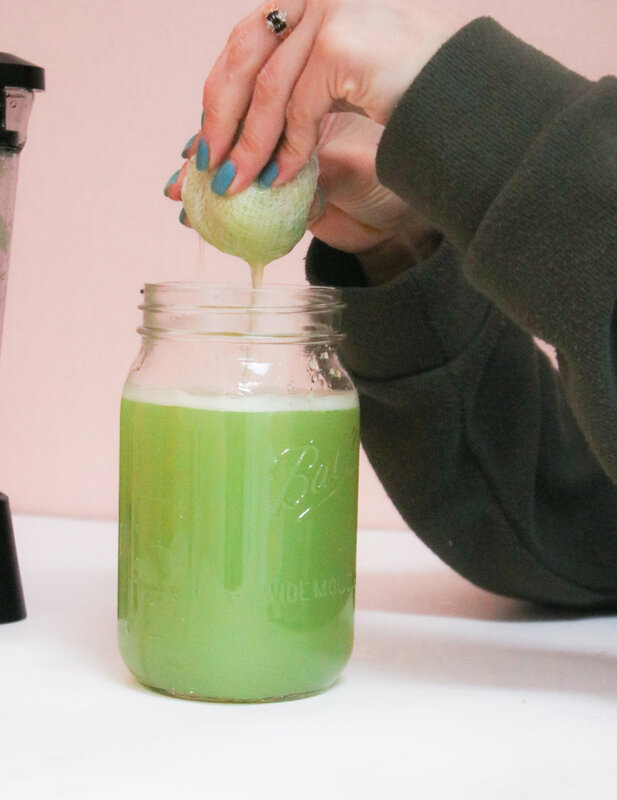 Don’t fret if you don’t own a juicer, I make my daily celery juice using a blender! Below I will share with you how I make my own celery juice at home. 1. Wash and roughly chop the head of celery into shorter sticks. 2. Add to a blender along with water (I use one large bundle of celery + 5 cups water). 3. Blend for a few seconds until broken down. 4. Pour into a large mason through a nut-milk bag or cheese cloth. 5. Squeeze through the juice and compost the remaining fiber in the nut-milk bag or cheese cloth. 6. Drink desired amount and refrigerate any remaining celery juice! I highly encourage you to give celery juice as try as it’s been incredibly beneficial for my health! Of course, if you have any questions or concerns, consult your doctor first. I’m curious! Have you tried celery juice or are you going to jump on the bandwagon after reading this post? Let me know in the comments!